A national historic site, Gastown in Vancouver, BC, is a bustling urban center, full of charm, nightlife, fabulous shopping, and many of the city's most acclaimed restaurants. The oldest neighborhood in Downtown Vancouver (and still technically a part of "Downtown" as defined by the City of Vancouver's official neighborhood boundaries), Gastown was named after "Gassy" Jack Deighton, a steamboat captain who opened the first saloon in Gastown in 1867. Gastown was also the site of the Hastings Mill sawmill and seaport, as well as the termination point for the Canadian Pacific Railway. These elements combined to make Gastown an industrial hub and a rough-and-rowdy spot for bars, nightlife, and brothels. Gastown fell into disrepair after the Great Depression and reached its nadir in the 1960s as Vancouver's "skid row;" after "rehabilitation" in the 1970s, it continued to be a lower-income area well into the 1990s/early 2000s. Though it attracted some tourists to its historic building, cobblestone streets, and landmarks, it wasn't until the early 2000s that the area began to gentrify. Today, Gastown is a model for urban revival and gentrification: it is now one of the most sought-after locations for young urban professionals, and home to many of the city's best restaurants, bars, and shopping. Gastown is situated in the northeast corner of Downtown Vancouver and borders the Downtown Eastside and Chinatown/Strathcona on its east side. Gastown's official boundaries run from Water Street in the north, Richards Street to the west, Main Street in the east, and Cordova Street to the south. The last ten years have seen such rapid gentrification in Gastown that there are now many young professionals (20 - 40) snapping up the new, high-end housing. Gastown residents have, on average, smaller households than the Vancouver average, probably because they tend to be younger, single, or couples without children. Though the area isn't as diverse as its neighbor, Strathcona (home to historic Chinatown), it does attract many international immigrants. Gastown is one of the busiest and most popular Vancouver Nightlife Districts; it's home to bars, pubs, and several of Vancouver's Best Cocktail Bars (including The Diamond and L'Abattoir). Gastown restaurants include several unique restaurants from pioneering Gastown restauranteur Sean Heather, including The Irish Heather (and it's famous Long Table Series of communal dining) and Judas Goat. Other popular restaurants include the Pourhouse and Chill Winston (which has one of the best patios in Vancouver). Gastown restaurants have received international press with Mark Brand's (another one of Gastown's leading restauranteurs) Gastown Gamble, a 2011-2012 reality show that profiled Brand's takeover of the iconic Save-on-Meats. Gastown is the place to shop in Vancouver for interior design/furniture and men's fashion and is home to many independent boutiques and local designers. It's also home to the flagship Fleuvog store; John Fleuvog created his world-famous brand in Gastown during the hippie 1970s. 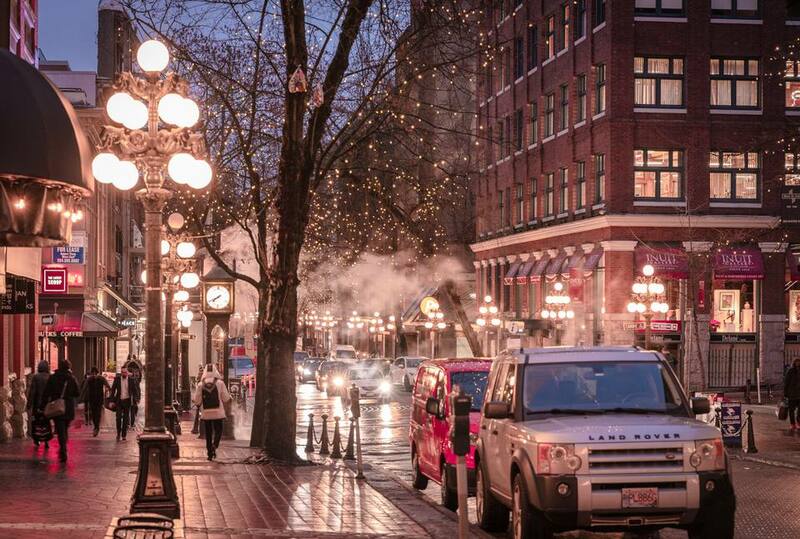 Along with Gastown's cobblestone streets and historic buildings, the area is also home to several famous landmarks. There's Maple Tree Square, which has a statue of "Gassy" Jack Deighton at its center, and the steam-powered clock at the corner of Cambie and Water Street, pictured above and in many Gastown postcards. The Gastown Steam Clock also appears on the cover of Nickelback's 2011 album Here and Now.